This entry was posted in Teotitlan del Valle, Textiles, Tapestries & Weaving, Workshops and Retreats and tagged cochineal dye, INDIO Durham, Mexico, Oaxaca, sale, workshop. Bookmark the permalink. 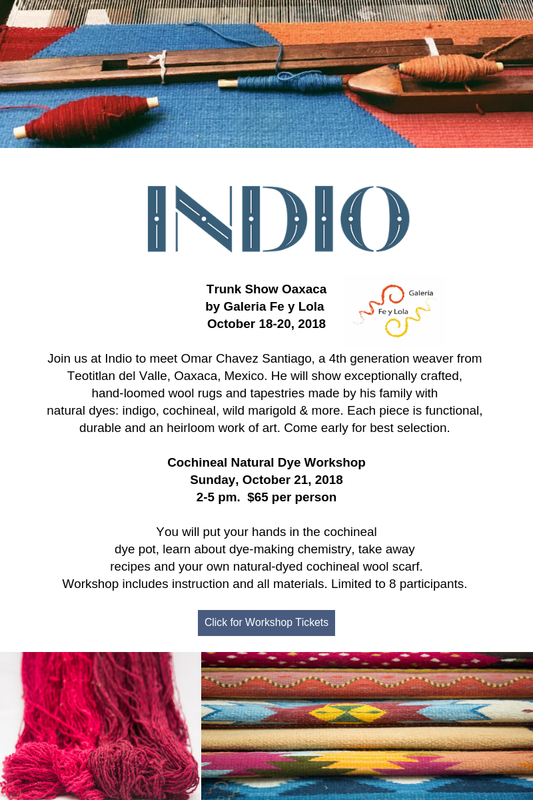 I’m very interesting about this workshop(oaxaca-cochineal-dye-workshop-in-durham-north-carolina). Could I know about whether the reservation has ended? And I still have some doubts about the payment of fees. Is all the accommodation (shared room) in Tokyo about 500 US dollars? And all the workshop will cost about 3000 US dollars without air tickets? And could I know which language will be used in this workshop, English or Japanese?